I thought at first that they were tomato plants. But as I kept walking past the row of plants near a building on the way to my Edgewater bus stop, I kept thinking "They're taller today." When I went to another bus stop for a few days, then back past the plants' street, the plants would be six inches taller, even eight inches -- in a day or two. No tomatoes were turning up, either. As August progressed, I was looking up to figure out how tall the plants were getting. I started to find spindly green pieces forming atop the stalks. The spindly groups got me hoping for sunflowers, because they reminded me of Vincent Van Gogh's famous 1888 paintings of sunflowers. The green forms were exactly the right shape. 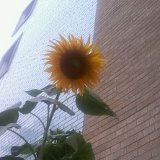 At last, one recent morning, I found a sunflower in the process of blooming. Unlike Vincent, who had to race "to complete his canvases before the flowers wilted," I was able to photograph the bloom in progress. Vincent painted a series of sunflower pictures to be installed in the studio of the Yellow House, the planned "Studio of the South" to which he invited Gauguin. Vincent described the project in a letter to painter Paul Bernard as "a decoration in which the raw or broken chrome yellows will blaze forth on various backgrounds -- blue, from the palest malachite green to royal blue." The sunflowers in Edgewater are "blazing" yellow, even on cloudy days. 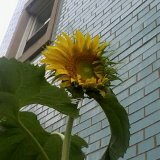 Maybe my neighbors knew about Van Gogh's plan when they set up their bed of sunflowers, because there are tan bricks and blue-tiled bricks beside the flowers, now in the background of my photos. But just as much as watching the flowers, I'm struck by the joy of reading about the paintings of them. What a writer Vincent was -- perhaps even greater than as a painter. My experiences with the local sunflowers continue, so I promise a further post about them -- and further exploration of their "portraits." Meanwhile, you'll have the old-fashioned experience of waiting to get something to read from a faithful correspondent (namely me). What will bloom next? Find out by typing your email address in the box and click the "create subscription" button. My list is completely spam free, and you can opt out at any time. Art sure enriches our lives. Great post! Wonderful post! Thank you for sharing this beauty. You're so welcome. I'm glad you enjoyed it.